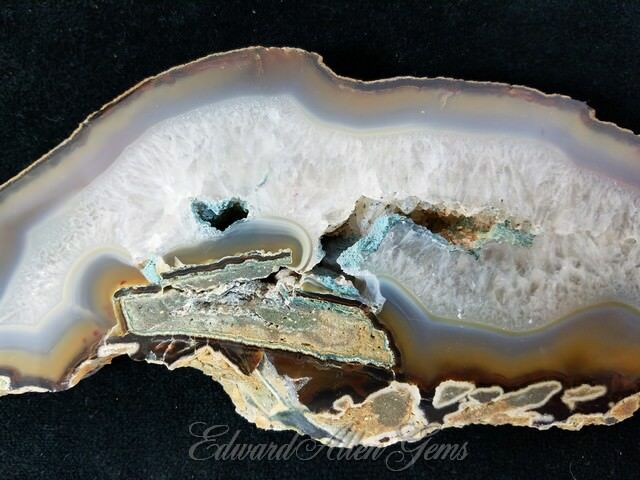 Go to DISPLAY SPECIMEN INDEX, DECORATOR PIECES, GEODES, MINERALS, PETRIFIED WOOD, SPHERES, PREVIOUS PAGE NEXT PAGE. 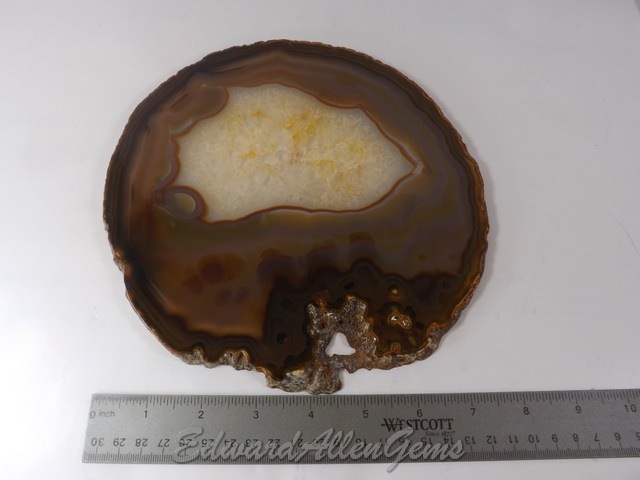 This page offers some of the Brazilian Agates we have for sale. We ship to the U.S. as well as internationally. However, there may be an additional shipping cost for international orders. 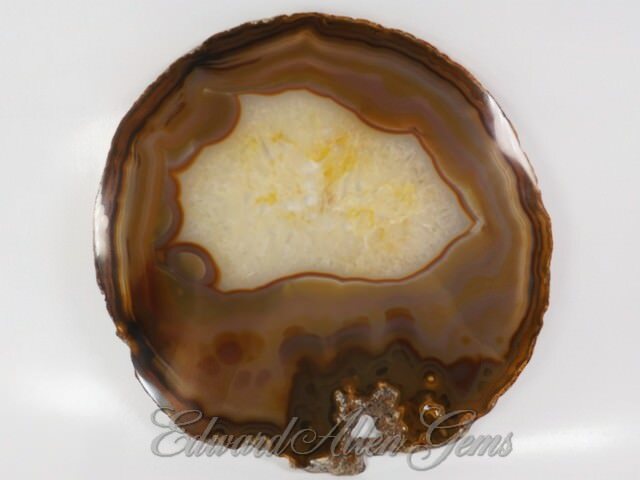 If your order requires additional shipping, we will either contact you before we ship, or you can email us for an invoice. Thanks! 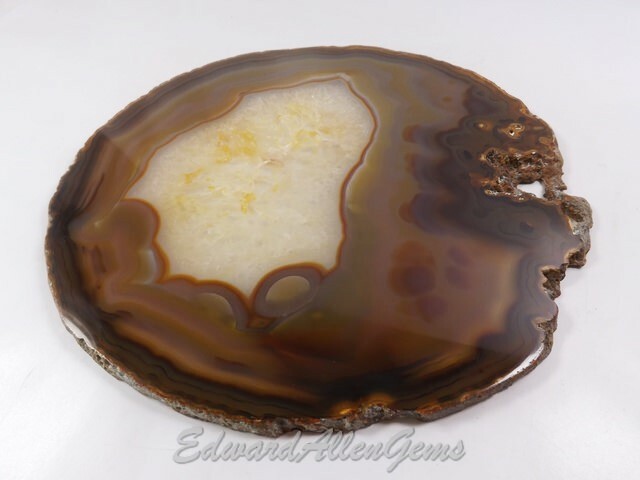 This piece is a beautiful larger Brazilian Agate slab, acquired from an old-stock collection. 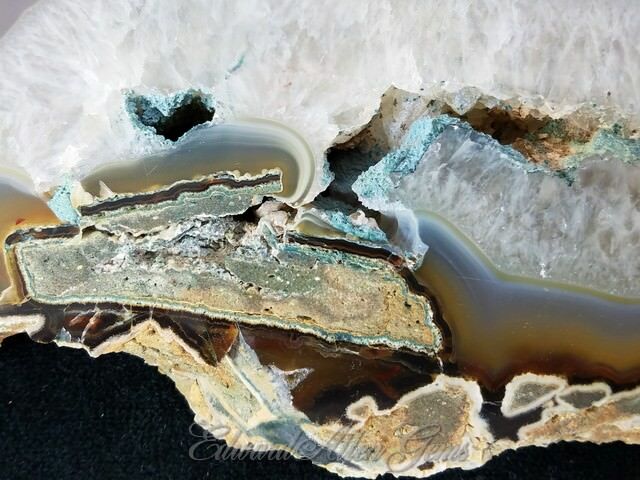 It has unusual inclusions in it and an open crystal center with what looks like some type of copper mineral growing. The coloring is natural. It measures about 8 3/4" x 3 1/2" and over 3/4" thick. It weighs 1 lb, 8 ounces, or 670 grams. 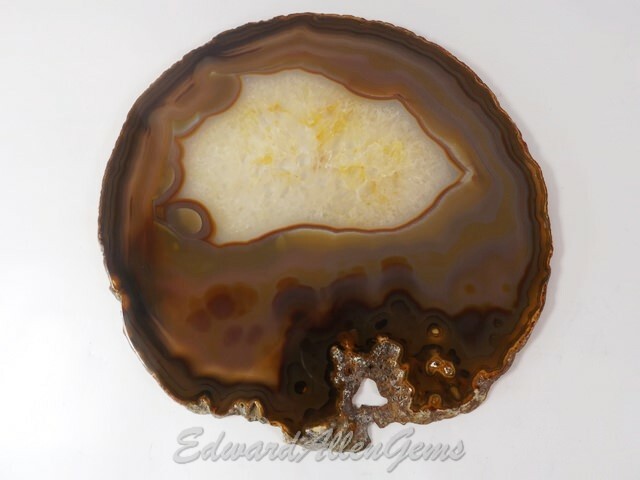 This Brazilian Agate slice has what looks like plumes of golden colored and black color. 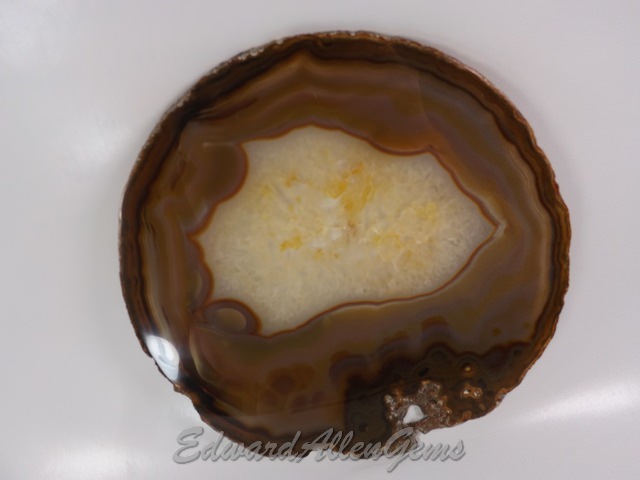 It is another slab we acquired from an old-stock collection. 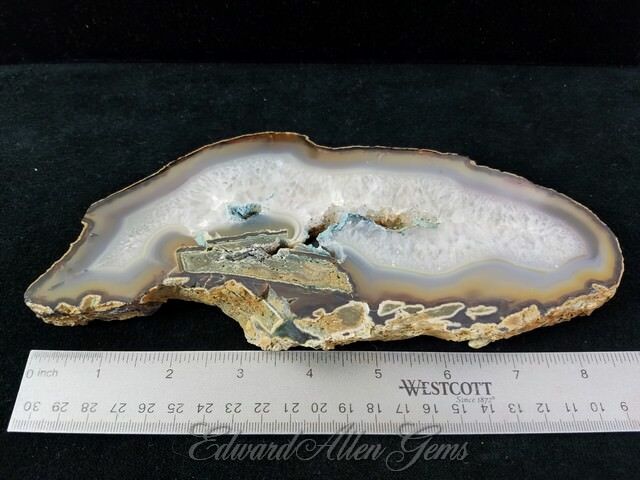 This one measures roughly 5 1/2" x 4 3/4". It is a little less than 7/8" thick. It weighs 635 grams, or 1 lb, 6 ounces. 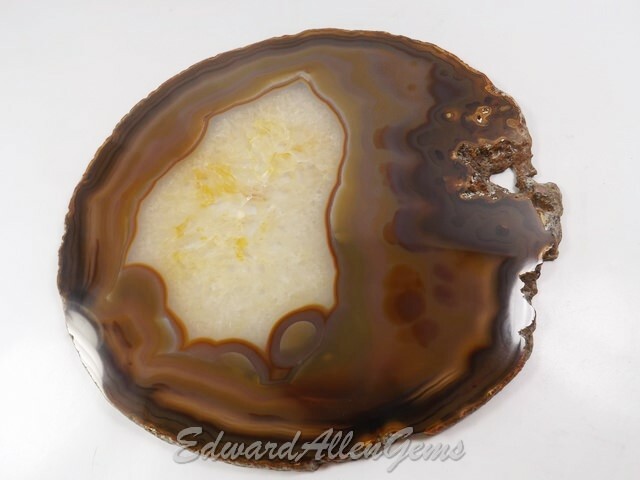 Very neat agate! This is another old-stock slice of a Brazilian Agate. 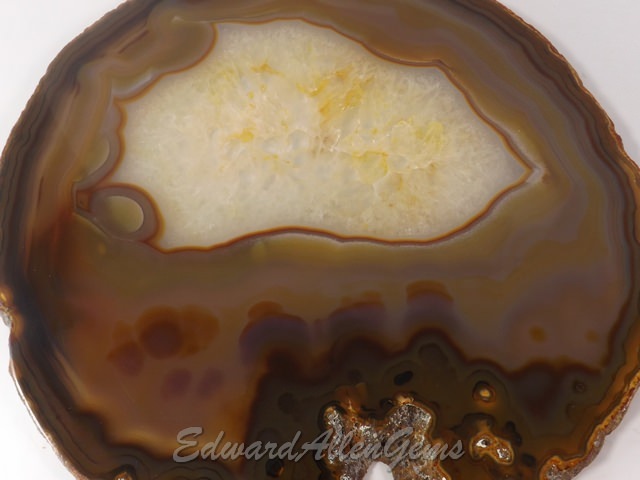 It has a beautiful white crystal druze pocket with beautiful dendrites around it. 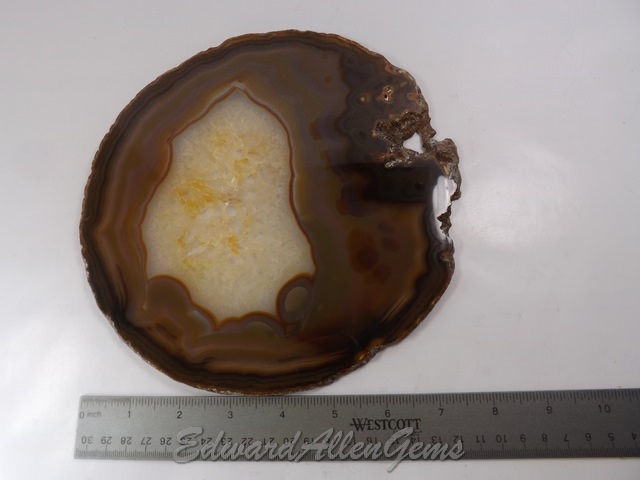 It is about 6 3/4" x 6" and a little over 3/4" thick. It weighs 1 lb, 12 ounces, or 800 grams. 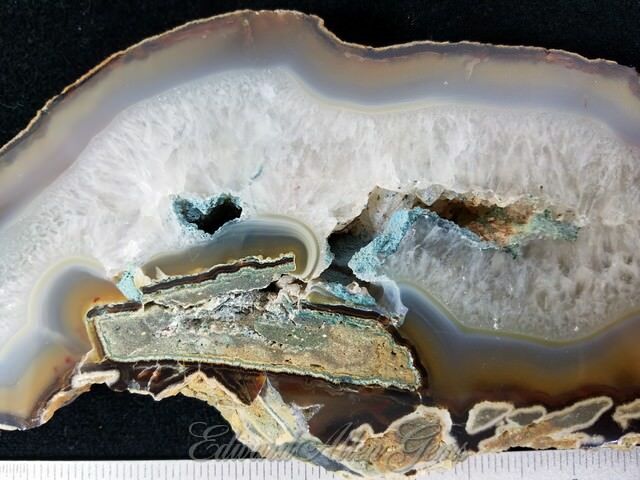 This is a high quality slice of a Brazilian Agate. It has been polished on both sides. 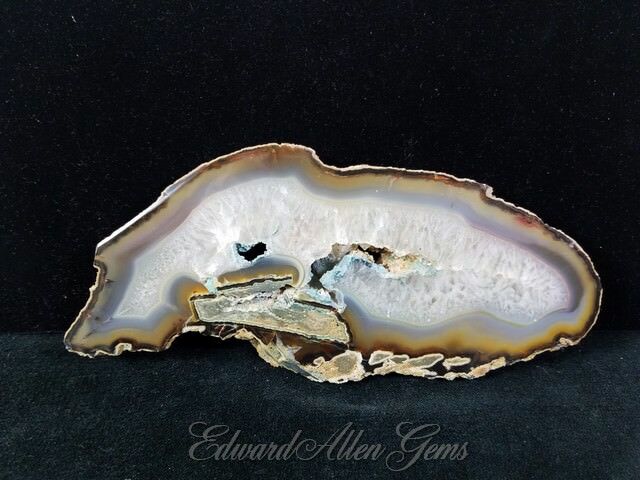 Awesome crystal patterns, including a pocket that opens on both sides, filled with very tiny druzy crystals. It appears to us to be natural, but with the red and yellow colors, we can't say that for sure. If color enhanced, it has been done beautifully! 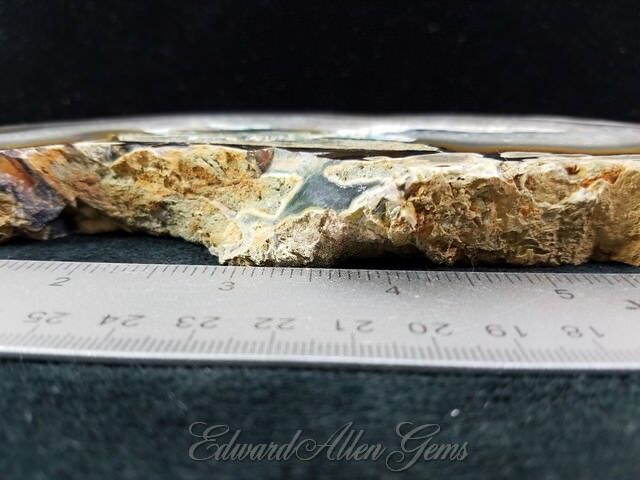 It is 7 3/4" x 4 1/2" at its widest points, and 5-6 mm thick. It weighs 9.3 ounces, or 265 grams. 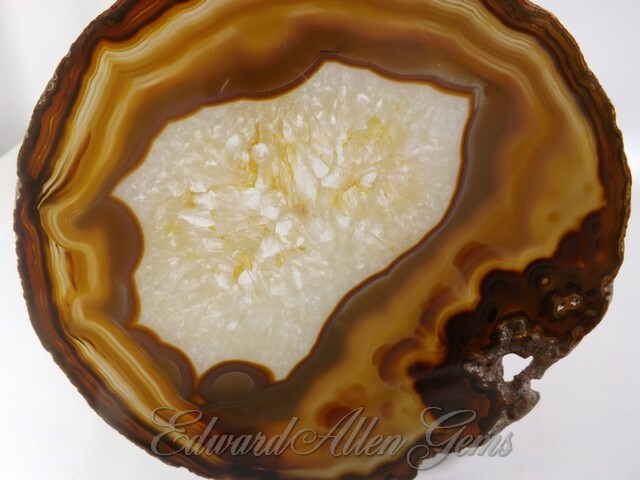 This is another beautiful, high quality slice from a Brazilian Agate Geode, polished on both sides. 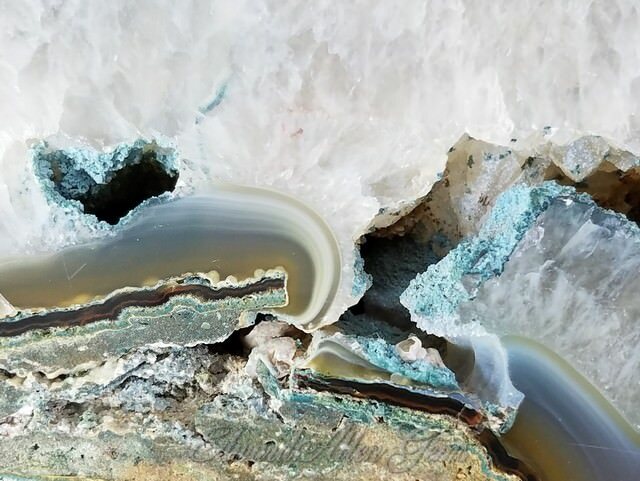 We believe it is natural coloring. 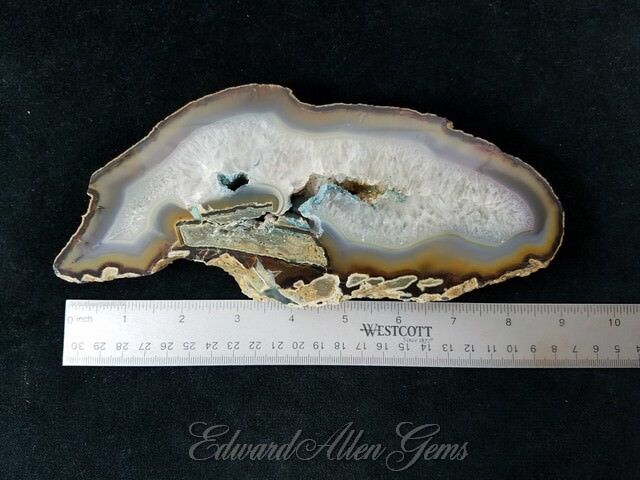 It measures 8" x 7" at its wider points, and is 4-5 mm thick. It weighs 11.3 ounces, or 320 grams. 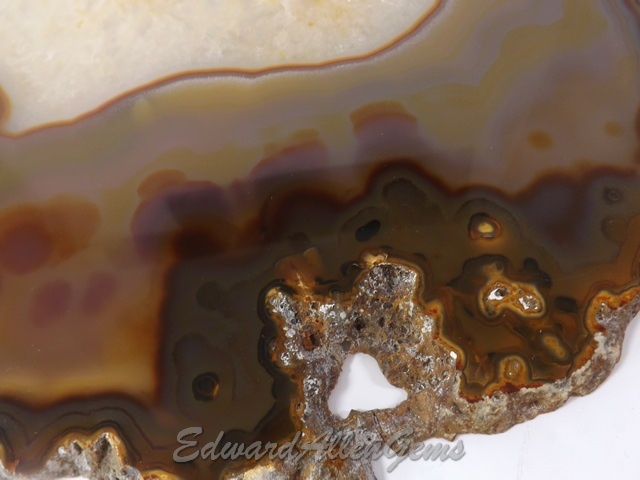 This is another polished slice of a Brazilian Agate. 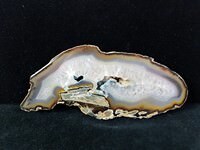 It is 6 1/2" x 3 1/4" at its wider points, and 6 mm thick. It weighs 5 ounces, or 140 grams. We believe it has probably been color enhanced.